U.S. brokerage sales were down 2 percent in March, compared with the same month a year earlier, and for the first quarter of this year sales were down 5 percent, but seen through the longer lens of 2010 to the present, sales have followed a fairly standard pattern. Considered in the aggregate, reports by YachtWorld.com member brokers in their proprietary database, Soldboats.com, indicate that a new post-recession norm for the first quarter is just shy of 6,000 boats changing owners. Total sales for each full year since the recessionary years of 2008 and 2009 have been between 28,757 and 29,556, and so far, 2013 seems no different. 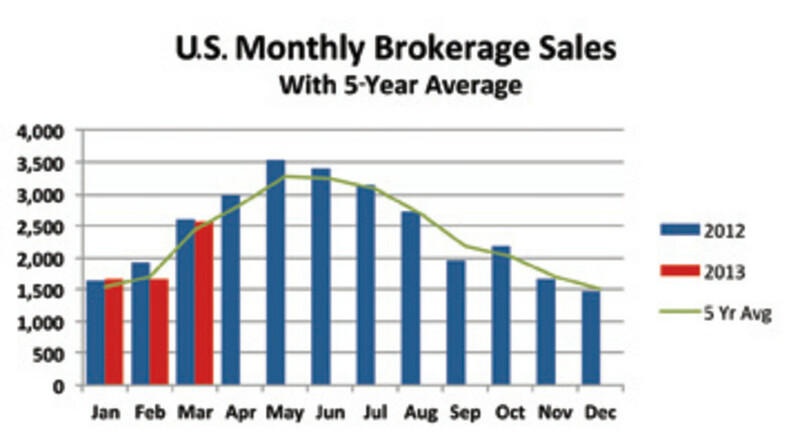 Looking at the U.S. monthly brokerage sales chart, one interesting question is whether 2013, which has not quite matched 2012 to date, will remain weaker or will be able to pull even come summer, when 2012 sales began to falter. In many respects, the year 2013 in brokerage has demonstrated its own personality to date. Superyacht sales were no higher, but prices paid were rising dramatically, up from $218 million to $387 million. Sales of other large yachts were lower and prices were down, sometimes dramatically; sales of 56- to 79-foot boats were off by 24 percent, with 147 sold, and the total price was down 27 percent, to $112 million. And although the number of powerboat sales was lower by 6 percent, with 4,741 sold, sailboat sales were holding their own, with 1,164 boats sold, up two from the first quarter of 2012. Looking at March alone, U.S. sales were down 2 percent from the previous March, with 2,554 boats sold. The total price paid rose $117 million, to $495 million, a 31 percent gain. In sales of boats over 80 feet, the total price increased $133 million, which was offset by a significant decline in the total price paid for boats 56 to 79 feet — $24 million. If we remove the volatile top end of the market and only consider sales of boats 55 feet and smaller, the total sold was lower by 37, at 2,473, but the aggregate price paid increased from $182 million to $190 million. However, the only size category that recorded a sales increase was 26 to 35 feet, which was up by one boat, at 916.